Barefoot Angie Bee: December Plank Challenge!! December Plank Challenge starts tomorrow!! I am starting off with 1:00 minute and then going up 30 seconds per week for the month to end up doing 3 minutes. The first is on a Sunday so I am going to go up 30 seconds every Sunday. I will post a BONUS dynamic challenge once a week. Some things like side planks and transitions and things like knees to elbows. I am going to post daily updates on my Facebook page so come update with me! Days off are for you to decide on. Personally I like to do 3 days on one day off. Thats what seems to work for me. Some people only need one day off a week some more. Go with how you feel. This also means that you don't need to feel bad for skipping a day because you feel sick or something like that. Listen to your body! Not up to a minute yet? Start at 30 seconds for a few days and then after three days go up 10 seconds a day until you get to 1 minute. 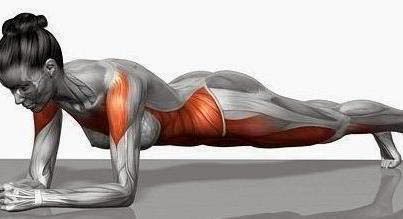 I find that planks are a mind game as much as anything. Your head needs time to get used to doing them. MAKE FRIENDS WITH THE BURN!! It means your body is doing marvelous work! Love it! Set a timer for the amount of time you are planking for not a stopwatch to see. Set the timer! Constantly take quick stock of your form!